TENS of thousands of Muslims have made a symbolic pledge to promote peace and harmony in society. Known as the Bai’at pledge of allegiance, the stirring move came as more than 38,000 worshippers united for the Jalsa Salana convention. Muslims unite for the Baiat ceremony. Picture: AMA UK, 2018 The three-day annual event – the UK’s largest and longest-running Muslim convention – took place at Hadeeqatul Mahdi in Alton, Hampshire, at the beginning of the month. Among those who attended was Basira Ajmal from Havant, who recently spoke out against Tory MP Boris Johnson, following controversial comments he made about the burka. The Bai’at, she said, was ‘solemn, uplifting and soul-stirring’. She said: ‘On the Sunday afternoon, thousands of Ahmadi Muslims at Hadeeqatul Mahdi formed a human chain leading to the Khalifa (Caliph), His Holiness, Mirza Masroor Ahmad, head of the worldwide Ahmadiyya Muslim Community. 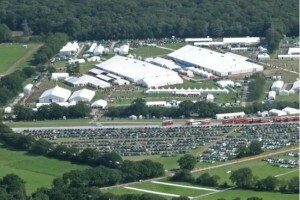 An aerial view of a section of the festival. Picture: AMA UK, 2018 ‘The participants and millions more around the world through live broadcast then repeated the words of pledge in unison behind the Caliph. ‘This pledge of allegiance committed us to abide by the peaceful teachings of Islam, which obligates us to live a life where no other living being suffers by our actions, words or any other means.’ Those there to witness the feat were not just Muslim, but came from multi-faith, multi-cultural backgrounds – with a number of non-Ahmadi attendees and non-Muslim guests present. Concluding his address during the Bai’at, Hazrat Mirza Masroor Ahmad instructed and encouraged members of community to assess their own moral compass and act as role models for a better society. He said: ‘It is a believer’s distinction that he stops others from evil and unnecessary speech. ‘But before stopping others, it is necessary that he make his own state so pure that he influences others towards righteousness. ‘He or she must improve their own moral state before guiding others. A person can only wield influence over others when he or she sets a positive example for them to follow.’ Worshippers were also urged to pray for world peace and harmony as the Jalsa Salana drew to a close.